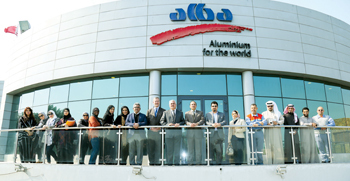 Aluminium Bahrain (Alba) has surpassed its annual sales record of 931,526 tonnes in 2014 by 2 per cent, reaching 951,944 tonnes in the following year, the company said. Production figures topped 960,643 tonnnes, up 3.1 per cent year on year, versus 931,427 tonnes in 2014. Q4 2015 sales grew 4.2 per cent to 252,582 tonnes compared with 242,322 tonnes in the same quarter of 2014 while production reached 243,614 tonnes for an increase of 9,695 tonnes. In addition, Alba managed to close 2015 with its value-added (VA) sales averaging 64 per cent of total shipments versus 66 per cent in 2014. Commenting on the company’s sales and production for 2015, Alba’s chief executive, Tim Murray, said: “We are delighted to be celebrating yet another record in sales and production despite the tough market conditions. As we move forward in 2016, we remain committed to doing better than necessary by improving our underlying performance and plant reliability”. Alba’s participation in one of the first events of the year – Aluminium Symposium 2016 in Florida, USA – marked its continuous commitment to expanding its reach across diverse territories, a company statement said. The symposium was held under the theme ‘Outlook for Aluminum in 2016’ and Alba’s chief marketing officer Khalid Abdul Latif, manager for Europe sales Boris Santosi and manager for Americas sales Patrick Hudson were present. In comments about Alba’s participation, Latif said: “GCC aluminium production constitutes 10 per cent of total world production and Alba is one of the five key primary aluminium producers in the GCC. The symposium, organised by Platts, is well-known as a global event that offers educational and networking value to all participants to meet with industry colleagues and understand the key trends impacting the aluminium industry. Alba held its first executive series training for 2016 at the Alba Oasis Hall. The workshop, part of the company’s executive education series, focused on aligning the management team on what needs to be done to further boost the smelter’s performance to combat the severe downturn in commodity prices. Executive development is a critical part of Alba’s leadership strategy, and numerous programmes and trainings are designed and orchestrated throughout the year to develop and prepare management for future growth. The 2016 series of Alba ‘Town Hall’ meetings was kicked off with the inaugural one taking place at the Oasis Hall. 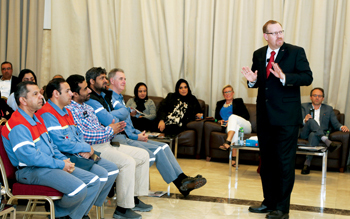 Murray briefed employees about the company’s performance in 2015 and expectations for 2016. “Town Hall meetings have become a tradition in our company – a platform that provides a direct means of communication with our employees,” noted Murray. “Alba had a remarkable 2015 on many fronts namely in terms of operational and safety performance with record production figures topping more than 960,643 tonnes. I thank the Alba board, management, Alba Labour Union, Alba Trade Union, and all the employees and contractors for this success. Senior Alba officials met with a delegation comprising professors and students from Arabian Gulf University in late December. Alba’s chief operations officer Isa Al Ansari, chief marketing officer Latif, administration director Abdul Rahman Janahi and training manager Rawdha Al Aradhi welcomed the delegation. For over 40 years, Alba has been committed to providing Bahraini nationals with meaningful careers and opportunities to grow within the company through its training and development programmes (TDP), which include continuous academic education and vocational training. Alba chairman Sheikh Daij bin Salman Al Khalifa met with India’s ambassador to Bahrain Alok Kumar Sinha. The meeting was held to familiarise Sinha with Alba’s pioneering role as the first smelter in the Middle East and its position as an industrial leader and economic pillar of Bahrain.